General Electric will be replaced by Wallgreens Boots Alliance in the Dow Jones Industrial Average. Shares of embattled GE fell about 1.6% overnight following the announcement, while Walgreens rose 3%. The change will make the index more representative of the economy, S&P Dow Jones Indices said. Follow GE’s stock price here – and follow Walgreens’ here. 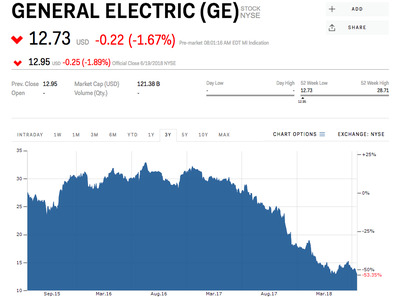 Shares of General Electric, an original Dow Jones Industrial Average member, sank about 1.7% ahead of Wednesday’s opening bell after the announcement it will be replaced by Walgreens Boots Alliance in the blue chip stock index. Walgreens, which merged with the Swiss-British Alliance Boots pharmacy in 2014, gained about 3% on the announcement. GE, founded by Thomas Edison in 1892, was the most valuable public company upon its inclusion in the index by Charles Dow on its creation in 1896. But the broad decline of the industrial sector and a foray into financial services decimated by the global financial crisis of 2008 led to the company being the sixth-smallest upon the announcement from S&P Dow Jones Indices on Tuesday. The shakeup will make the 122-year-old index more representative of the economy, the company said. GE’s stock price has fallen nearly 80% from its highs in 2000,Reuters reported. Last month, newly installed CEO John Flannery warned that the company’s once-dependable dividend may be in jeopardy in 2019. As the company sells off assets, including locomotive and power-plant manufacturing units, there have also been calls to even more significantly break up the company from activist investors. To be sure, there are beacons of light in GE’s otherwise grim outlook. Its aviation, transportation and healthcare businesses helped the company beat Wall Street estimates on its most recent quarterly earnings report in April.